If you are a Watford fan you can take your pick from a great selection of Watford football tickets for sale on Football Ticket Pad, available for every Watford Premier League home game happening this season. Watford tickets are also available for all their away fixtures with designated away section seating available at any Premier League game that Watford participate in the 2017/18 season. Watford are based just North of London in the borough of Greater London and play their home fixtures at Vicarage Road, a unique stadium with a capacity in excess of 20,000. If you are in London and fancy catching some Premier League action, Watford tickets could be a great affordable option from Football Ticket Pad and is a popular choice with customers given its quick and easy commute from Central London. Watford played at several grounds in its early history, before moving to a permanent location at Vicarage Road in 1922, where it remains to this day having undergone various redevelopments. The stadium is situated in Hertfordshire, north-west of central London, making it a perfect option for customers looking to catch some top Premier League action in an atmospheric setting with supporters packed close to the playing surface. Vicarage Road is a traditional four sided stadium offering unrestricted views across the stadium. The ground consists of three single tiered stands and one two tiered stand, The Graham Taylor Stand. Watford FC also houses a selection of VIP and corporate facilities which can be purchased through Football Ticket Pad for each Premier League, FA Cup and EFL Cup match this season. Sir Elton John Stand: Named after the famous musician and former club chairman, the single tiered stand on the East side of the stadium holds over 3,000 fans. The Sir Elton John Stand has undergone recent redevelopment and was reopened in 2014 after being rebuilt. Customers can sit here with Longside Lower seats from Football Ticket Pad, enjoying seats close to the action and on the same side of the pitch as the players tunnel and technical area. Graham Taylor Stand: This is the only two-tiered stand in the stadium and sits opposite the Sir Elton John Stand. Formerly known as the Rous Stand, it was renamed after their former manager housing the clubs Executive boxes and hospitality suites in the upper tier, including the 1881 Club. A perfect ticket for customers searching for Watford VIP tickets. Vicarage Road Stand: This stand is split between the Watford family section of the ground and the away supporters. Customers can purchase Shortside Lower tickets or away section tickets if they would like to sit in this part of the stadium. The Vicarage Road Stand was formerly an open terrace before being rebuilt in 1993 where it is now all seated and can hold over 2,000 away fans behind the goal. Rookery Stand: This is the largest stand in the stadium holding around 7,000 fans and this is where the most passionate and loudest Watford ticket holders sit at Vicarage Road. if it is atmosphere and noise that you are after, the Rookery Stand is the place to sit behind the goalmouth. Season / Members Cards: These Watford FC tickets are reserved seats which are available at Vicarage Road for every match of the 2016/17 season. Football Ticket Pad customers will then receive their Watford match ticket prior to the game, before returning their season/members card in a pre-paid envelope after the game. 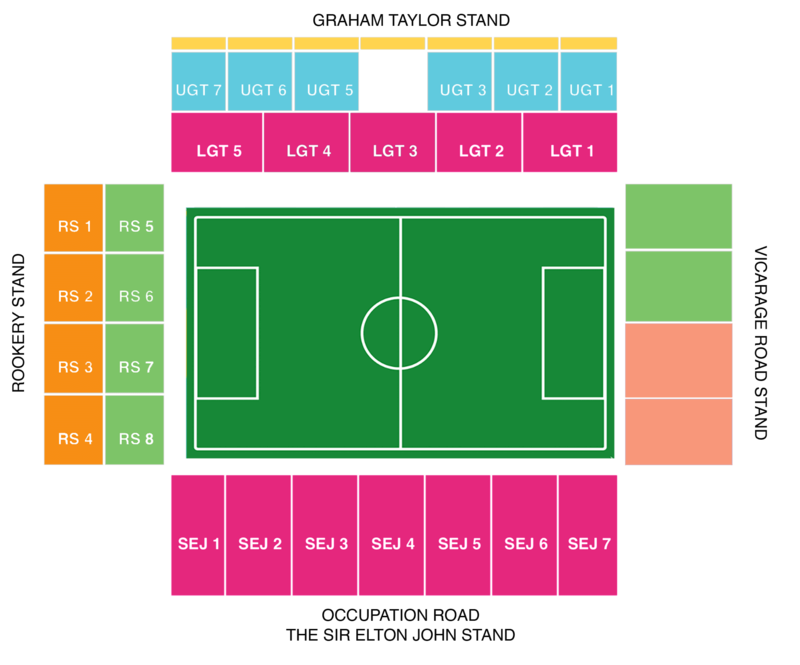 Watford Season / Members cards are available in various parts of the stadium and fans can see the available ticket types when browsing their intended Watford ticket page. Once customers purchase their ticket they then scan their season/members card at the turnstile to gain entry to the stadium. E-tickets: Watford tickets also carry an e-ticket option but this is only applicable for Football Ticket Pad customers purchasing Watford hospitality tickets. E-tickets are sent out as an email once payment confirmation is confirmed and customers can then scan the email barcode on entry to the stadium. There are plenty of hospitality options at Vicarage Road, particularly in the Graham Taylor Stand. Paper tickets: Once your payment has been confirmed on Football Ticket Pad your requested Watford tickets are then posted to the address provided in your payment details. Customers then receive their Watford tickets 3-4 days prior to the match and they will be notified by email once their tickets have been dispatched. Watford ticket holders can then gain entry to the stadium with their paper ticket at the turnstile. Watford were one of the favourites to be relegated having never lasted more than one season in the top flight. However, The Hornets defied the odds and ended the season in 13th place and reached the FA Cup semi-finals. Quique Sanchez Flores has signed no more than sixteen players in the summer of 2015, but it was the already fruitful striking partnership between Troy Deeney and Odion Ighalo which bared fruit for their success. By Christmas, Watford were sitting in seventh place, one point outside the infamous ‘top four.’ Watford had recorded impressive victories against Stoke City, Swansea, Newcastle and West Ham before perhaps their biggest result of the season, a 3-0 triumph against Liverpool at Vicarage Road. However, 2016 saw a turn in their fortunes as domestic form dipped culminating in only four wins in the Premier League to finish comfortably in mid table. Watford appeared to take their eye off their domestic form and focused on the FA Cup, which included a famous victory against Arsenal in the Quarter Final at The Emirates. This was not enough to save Quique Sanchez Flores his job and the Spaniard was sacked at the end of the season and replaced by former Inter Milan boss, Walter Mazzarri.